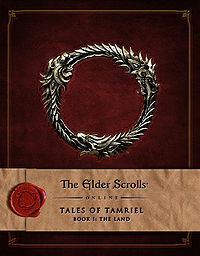 The Elder Scrolls Online: Tales of Tamriel is a two-volume tie-in to The Elder Scrolls Online published by Titan Books. It is a printed version of many lorebooks from the game, paired with concept art. Some of the art was not released before these volumes, but all text can be found in-game. Volume 1: The Land was released on April 21, 2015 and Volume 2: The Lore was released on November 17, 2015.